Christians today can find it difficult to relate to the people in the Bible, perhaps seeing them as merely characters in a lesson instead of as real people who lived out trying and often tragic situations. For instance, Paul the Apostle was just a man, chasing his own goals, when he was unexpectedly blinded and forced to question all his former certainties. “A Time to Act” is an innovative look into his turbulent life that brings 21st Century readers to appreciate the relevance of scriptural text in relation to their personal challenges and gives them a new understanding and empathy for the lives of those in history. Aside from being a published author, S.J. Knight is a former Australian Broadcasting Commission radio scriptwriter. 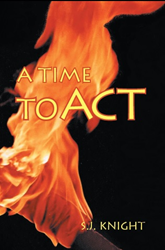 With past work ranging from biblical plays and a musical, to children’s books, A Time to Act is Knight’s fourth novel in the “A Time To” series. “I’m deeply involved with all of my characters,” Knight said. “Research opens a door to their world, which is very much alive. I love taking readers through that door with me." For more information, visit http://bit.ly/1SdHORj. S.J. Knight is an Australian, married with four children, currently resides in a riverside cottage in England, and enjoys house renovating and ballroom dancing.